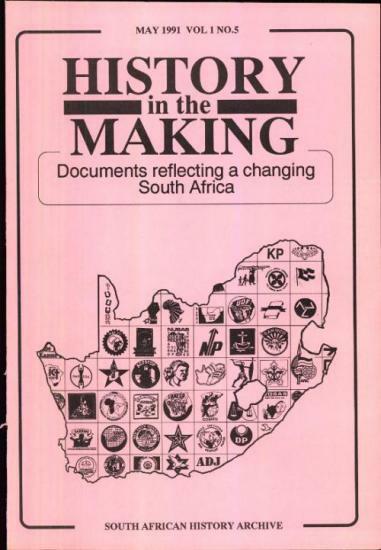 The original SAHA publication, this journal formed part of the organisation's commitment to making history accessible to all. Published in the early nineties, the journal was SAHA's attempt to provide a platform to discuss and assess the changes taking place during negotiations for a democratic South Africa. The aim was to reflect on both the dramatic unfolding of contemporary South African history, and the diversity of the struggle for a non-racial, non-sexist and democratic South Africa. It provided original documents which charted the unfolding of history. Speeches, minutes, discussion documents, interviews, posters, stickers, and banners which reflected all aspects of the changing times, were reproduced in this publication. It allowed people to make a constructive contribution to the process of change in South Africa. By reproducing primary documents in their raw format, the journal provided a lasting resource of archival material. Documents were selected and presented chronologically to reflect the unfolding of critical events. The documents reproduced were chosen to illuminate particular themes. Those themes were chosen in response to requests and suggestions from readers. The documents were reproduced verbatim. SAHA is now in the process of digitising each issue of the journal and making them available as free downloads from the SAHA website.